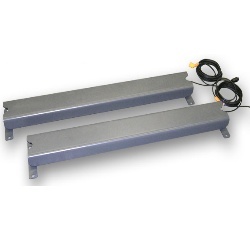 The Avery Weigh-Tronix Ag Scales Chute Weigh system is ideal for livestock weighing and herd management. The ease of installation and setup, allows the Chute Weigh system to be accurately weighing in just minutes. Installation can be portable or permanent depending on specific application. Kit includes: two Chute Weigh assemblies, Model 640M scale indicator with RS-232 port, indicator mounting bracket, 12 VDC wallmount transformer (NA or UK), AWT25-501727 12' power cable with 2-pin AWT power to Alligator clips for connecting to battery posts. The recommended Model 640M Indicator is packed with key features for this application: large backlit 1.1" LCD display, RS-232 port, Auto-Loc feature to capture livestock weight, Auto-Accumulate of livestock weight and Statistics with number of livestock weighed, total weight and average weight.